There is a lot of debate about a good buttercream and everyone has their tricks. 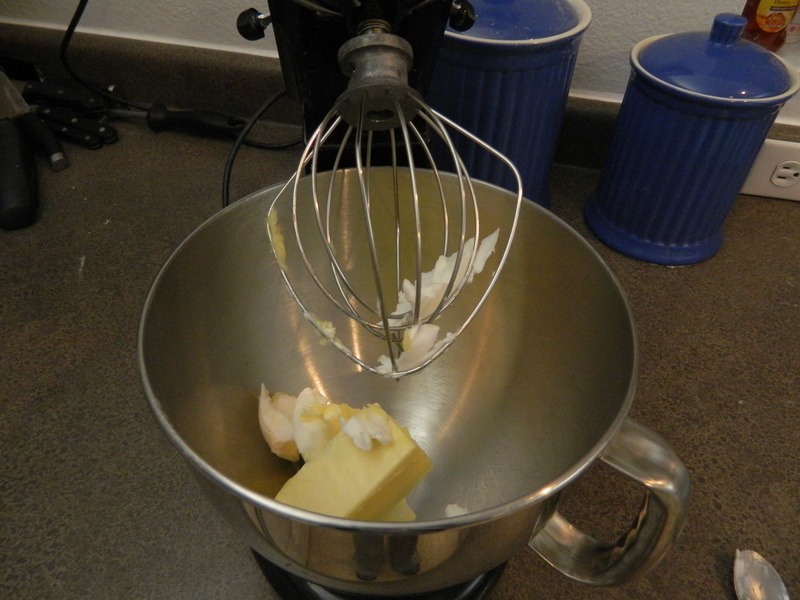 Mine is to dilute the butter with some plain vegetable shortening. The health food people in my life right now are fainting dead away. But MOST buttercreams are not just butter. When it’s all butter it has a cloying taste that sticks to the roof of your mouth. 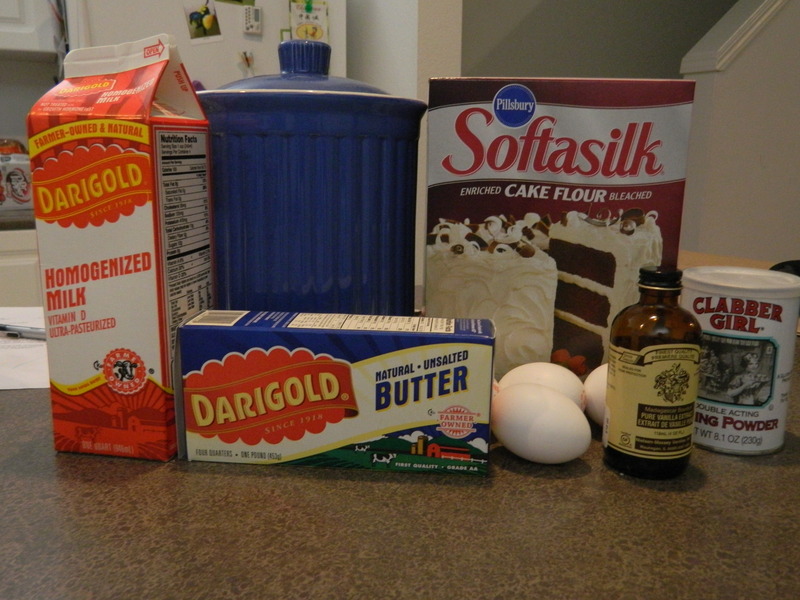 You need to add in some milk, vanilla extract and shortening. I went to a wedding last night and now having become somewhat of an expert on frosting, I could tell that the one they used for our individual wedding cakes was about 90% shortening. It was hard to eat. In fact, most places you buy a cake are going to have closer to a 60/40 ratio of shortening to butter. Don’t try to avoid it. Just eat it in moderation and you will be fine. 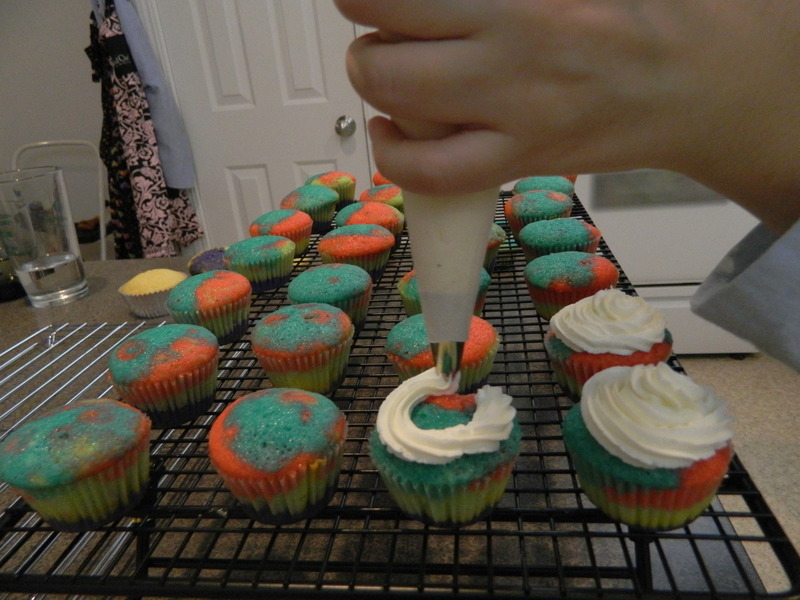 I personally like how a piped frosting looks on things i’m going to sell or show off, but really you can easily take a knife or offset spatula and smear it on. Making a buttercream is about adding in EVERYTHING slowly and making it the right consistency and taste for your preferences. 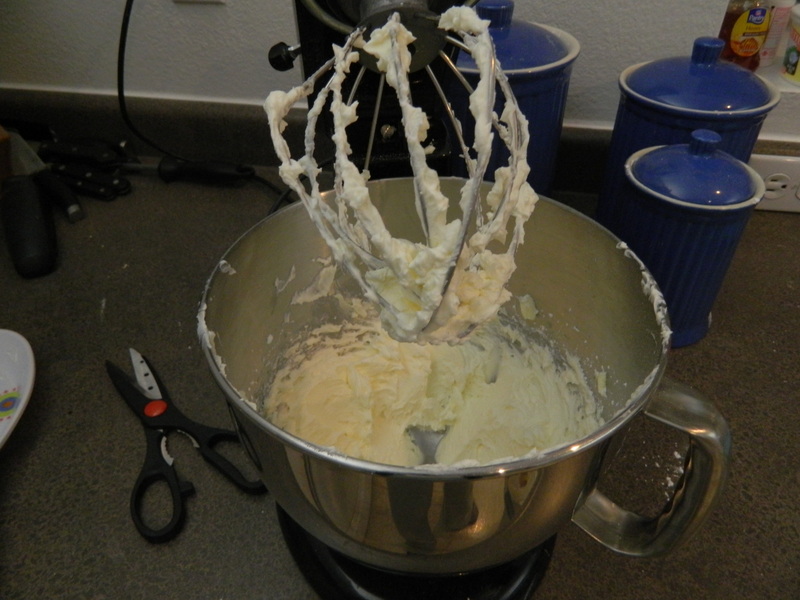 Put the butter, shortening and vanilla extract into the bowl of an electric mixer fitted with the whisk attachment and whir it on up. Add in the salt while it’s going. Stop and scrape down the sides. You want the mixture smooth and well blended. Slowly add in powdered sugar, 1/4 cup at a time. Add in a few tbsp milk. Slowly add in more powdered sugar. Get it to a consistency where it is light and fluffy and easily spreadable, but not runny or falling apart. Remember, you can always add but you can never subtract! 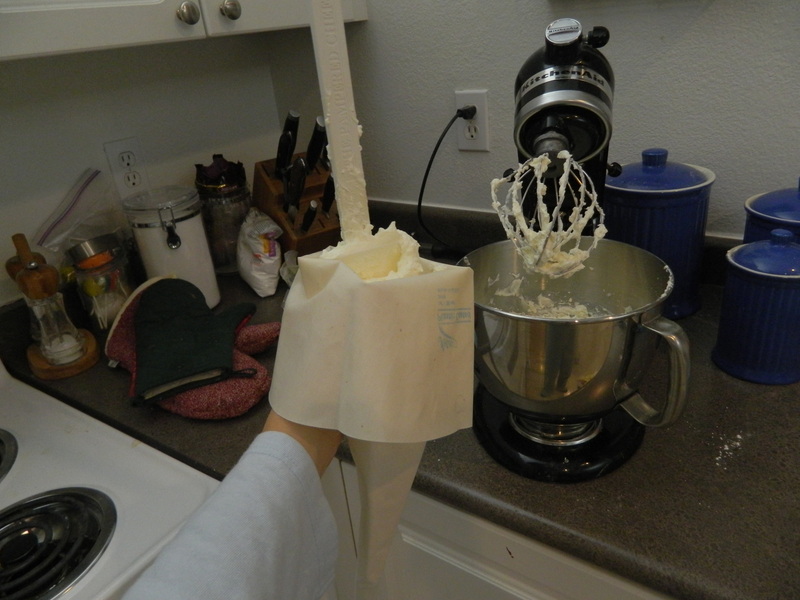 Put finished frosting into a piping bag, or just use an offset spatula and put it on your cupcakes. 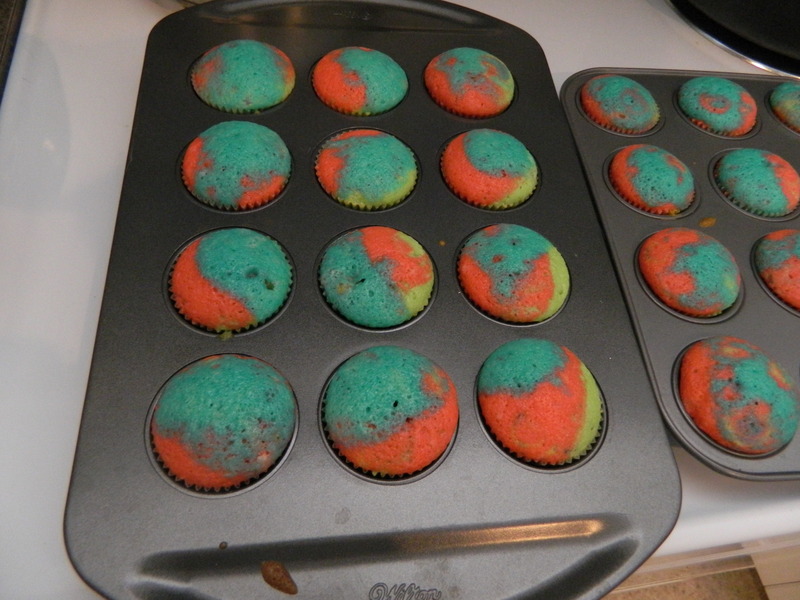 Makes enough for 24 regular cupcakes or a 2 layer 9-inch round cake. 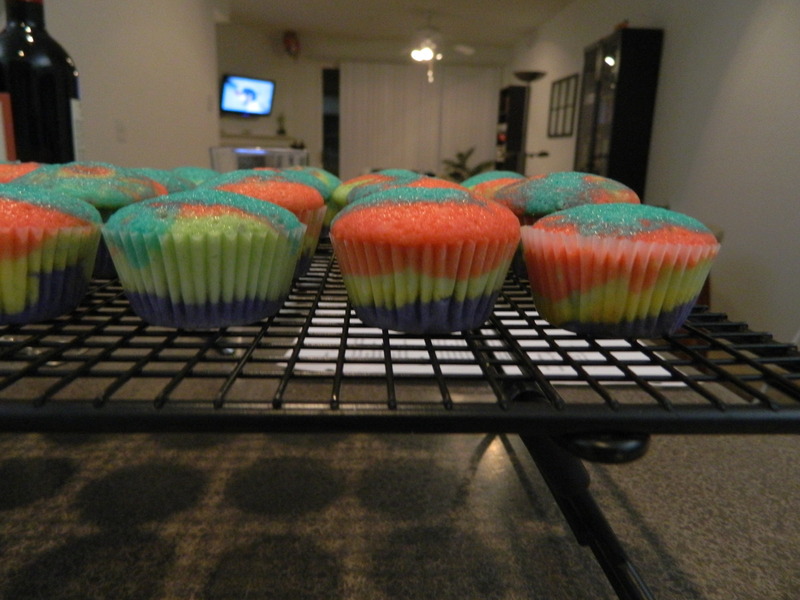 For a bake sale there is nothing better in getting kids to beg their parents to spend money than rainbow cupcakes. 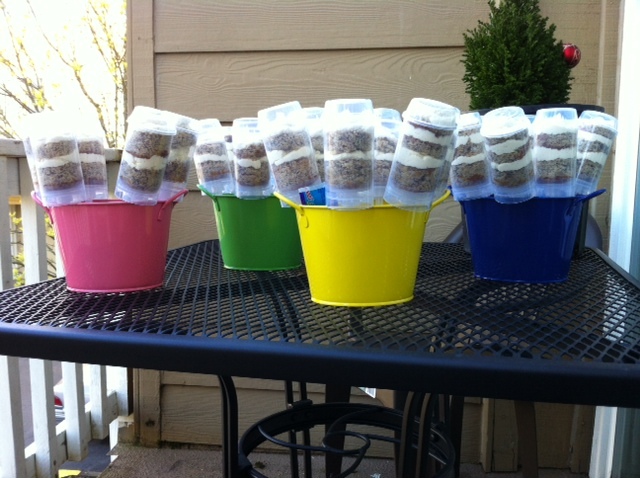 The colors beckon them, and the mini size makes parents feel better about letting their kids have a treat. 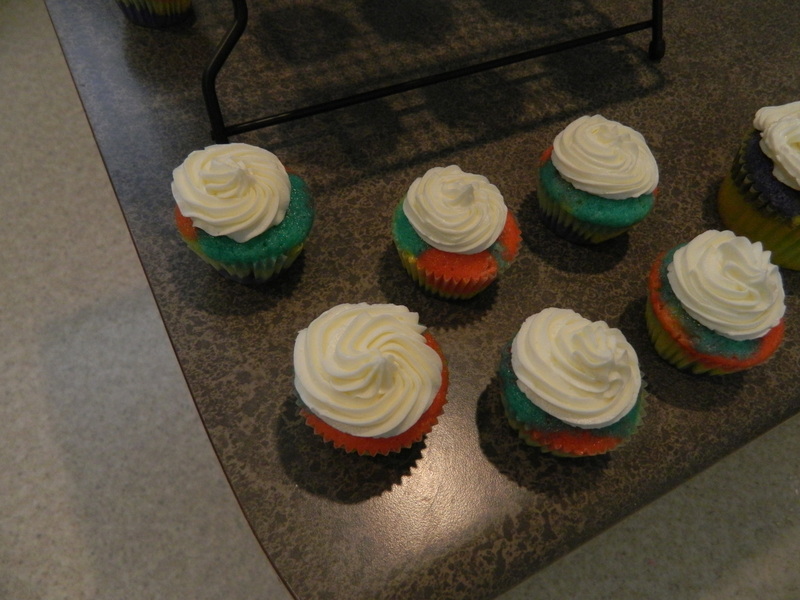 I used my go-to vanilla cupcake recipe that I found through Martha Stewart a while ago. First step is adding the dry ingredients into your bowl. 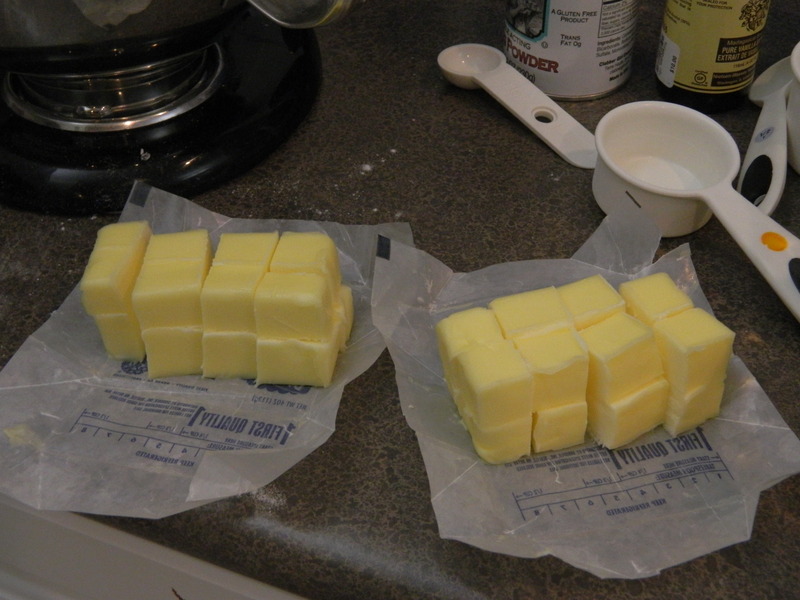 Cutting in some cubed butter (but not overly cold butter). 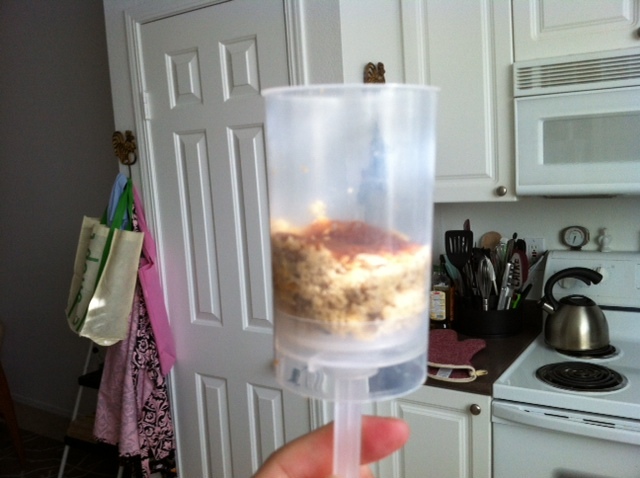 Then adding the liquid ingredients. It makes the cake dense and moist and really delicious. I also topped it with a simple vanilla buttercream which I’ll post the recipe for tomorrow. 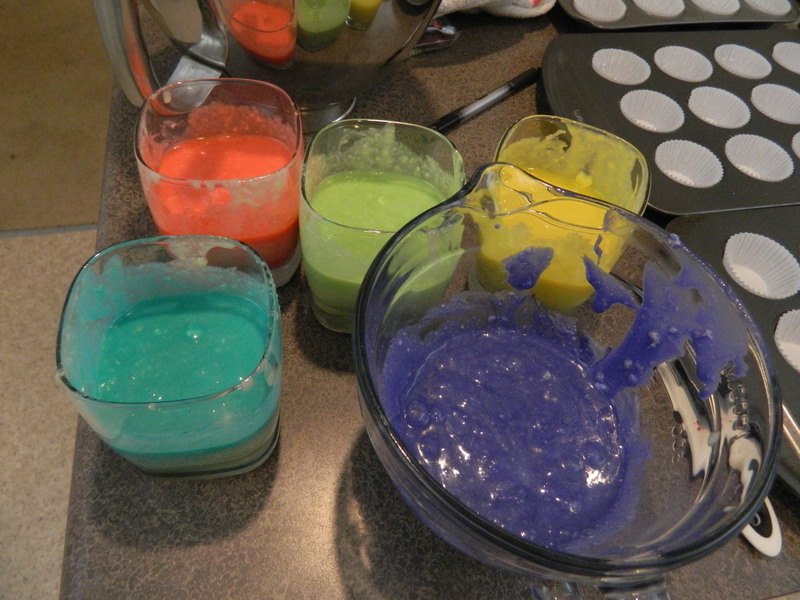 Making colored cupcakes is pretty simple, it just calls for dividing up the batter and coloring each a different color. 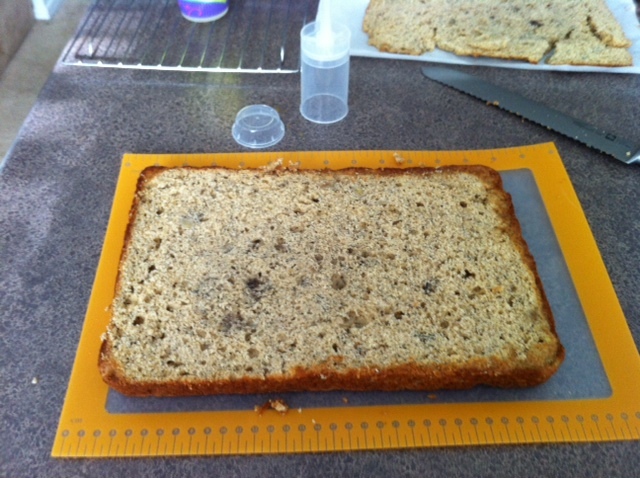 The time-consuming part is taking a little bit of batter and adding it layer by layer. Although it really doesn’t take as long as you’d expect. 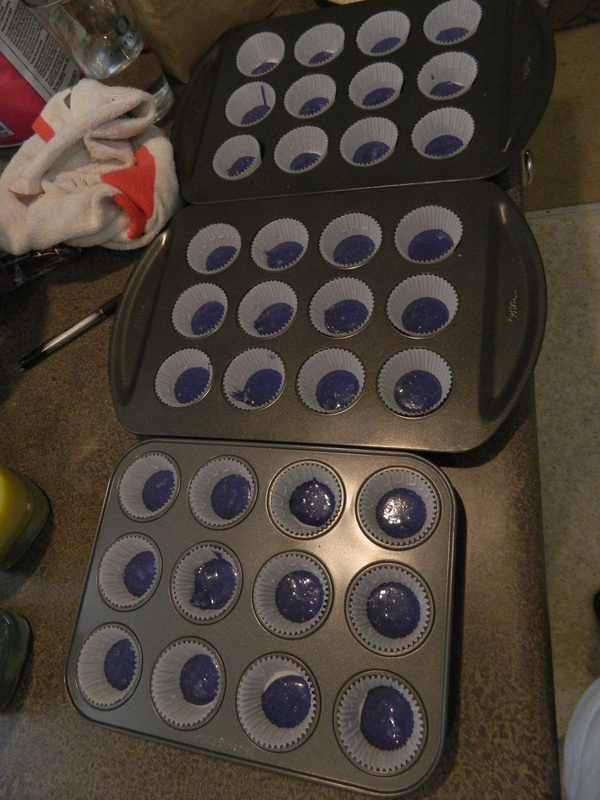 Line cupcake pans with paper liners; set aside. 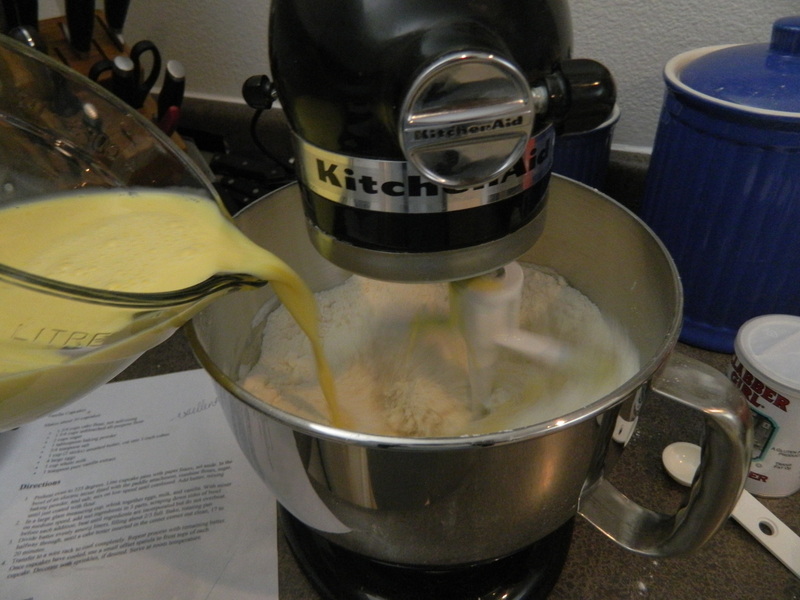 In a large glass measuring cup, whisk together eggs, milk, and vanilla. 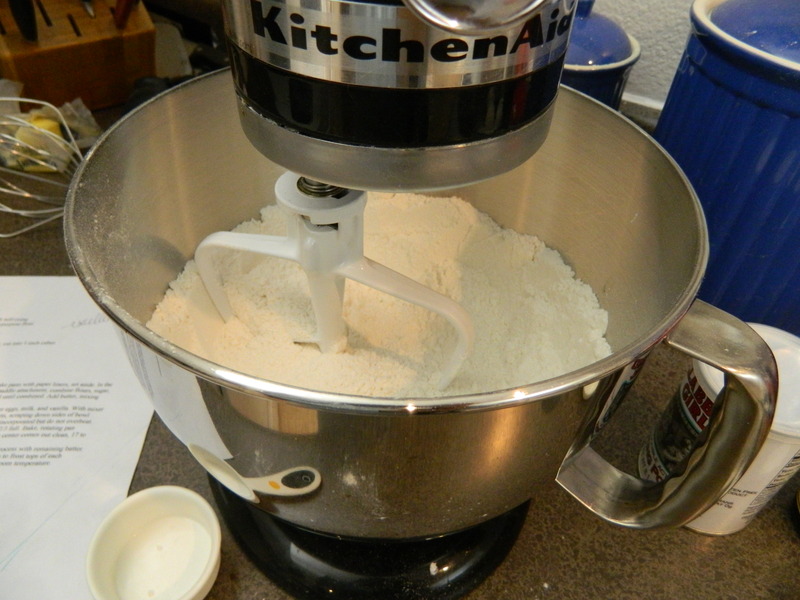 With mixer on medium speed, add wet ingredients in 3 parts, scraping down sides of bowl before each addition. Beat until ingredients are incorporated but do not overbeat. 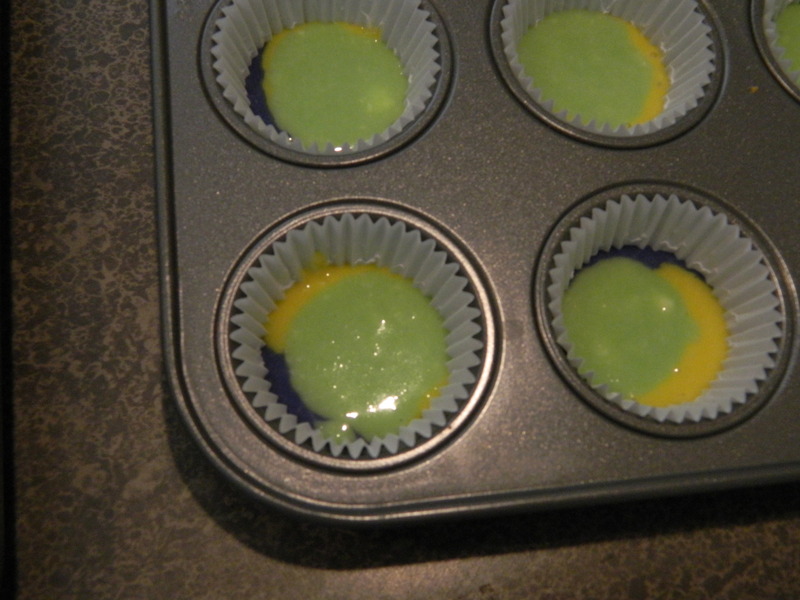 Bake, rotating pan halfway through, until a cake tester inserted in the center comes out clean, 10-15 minutes for mini cupcakes, 17-20 minutes for regular sized. 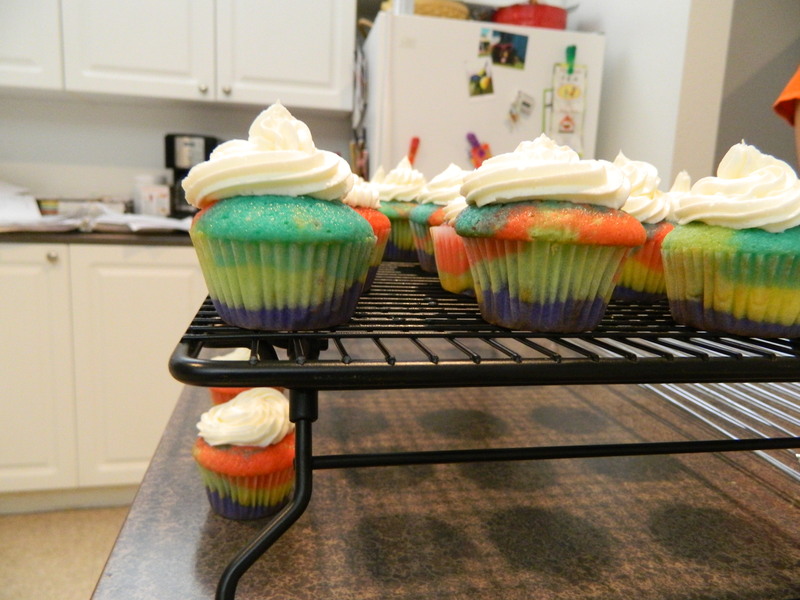 Once cupcakes have cooled, Frost tops of each cupcake and decorate any way you desire. Jen (the recipient of the shower) had said to me early on that if I was going to throw a shower she’d like me to know that her favorite cake was from Lamb’s Thriftway and was the banana cake with bavarian cream filling. I explained to Jen that I was not throwing her a shower, but we were going to do a spa day instead. Because I am the queen of surprises and after having successfully surprised the mother of my god-sons the week before for her 30th birthday, I figured the mother of my god-daughter (soon to be daughters) should share in the surprise vibe that I was feeling. 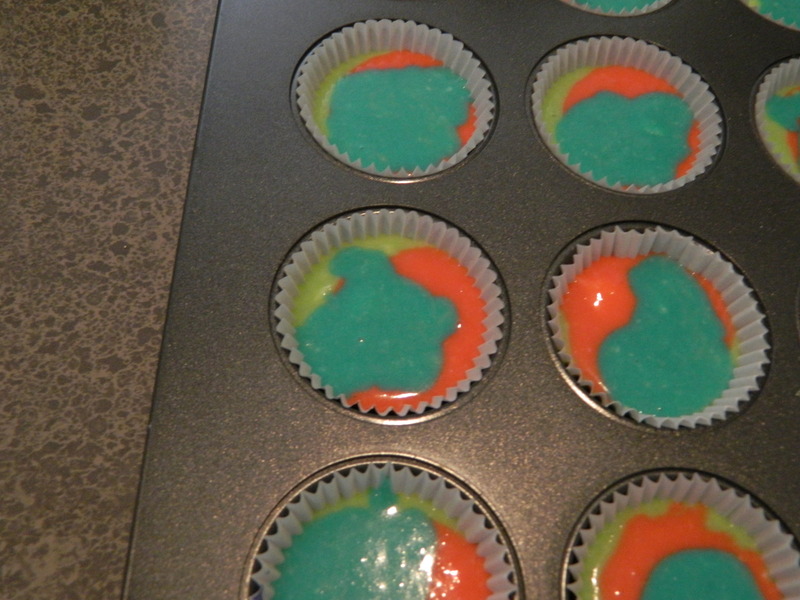 I stumbled across this new blog Cookies and Cups and saw a post for these adorable spring push-up pop cupcakes. It struck me that these would be perfect. I got my hands on some push-up pops and away I went. They are reusable so that does help with the price tag. 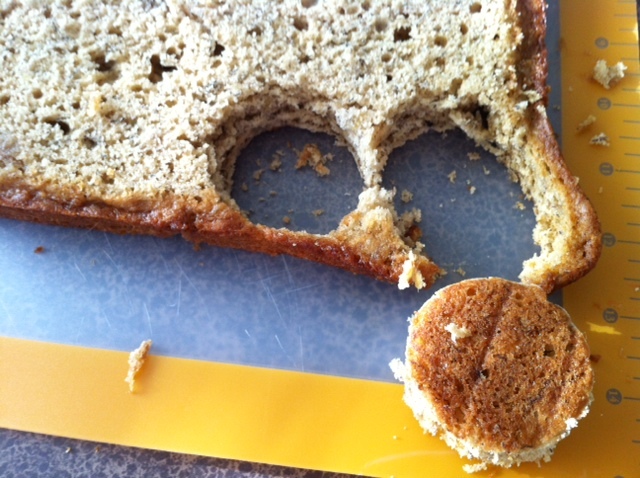 I took apart one of the push-up pops and used that to punch out perfectly shaped rounds from my banana cake. 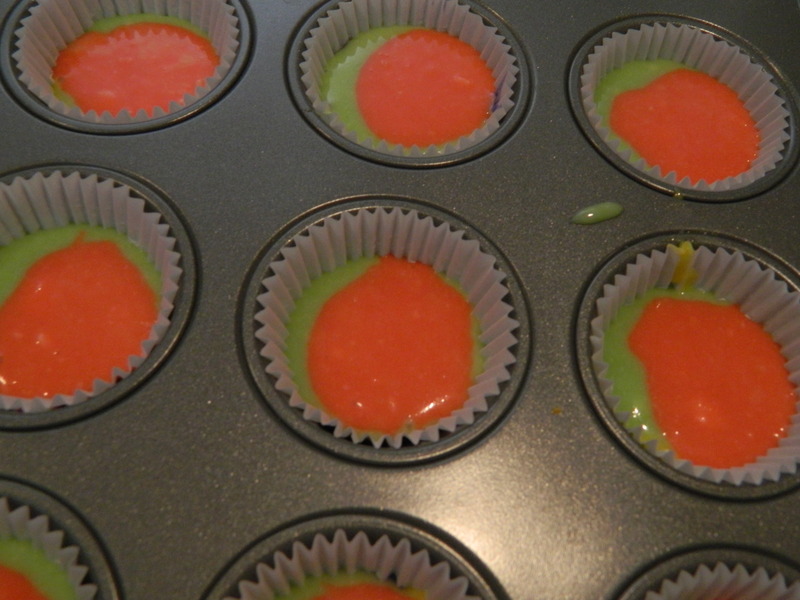 Once I had a round in the bottom, I used a pastry bag and squirted a layer of bavarian cream. 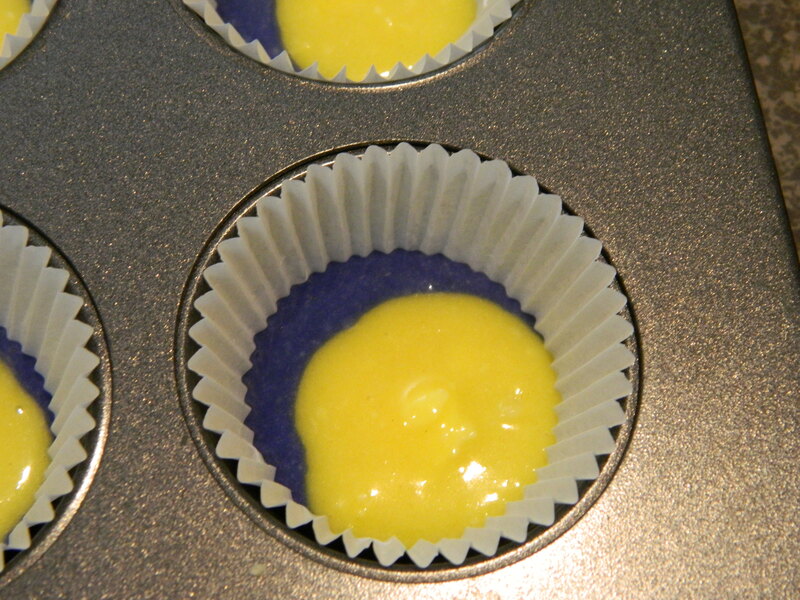 I then inserted another round and finally topped it off with another layer of cream. 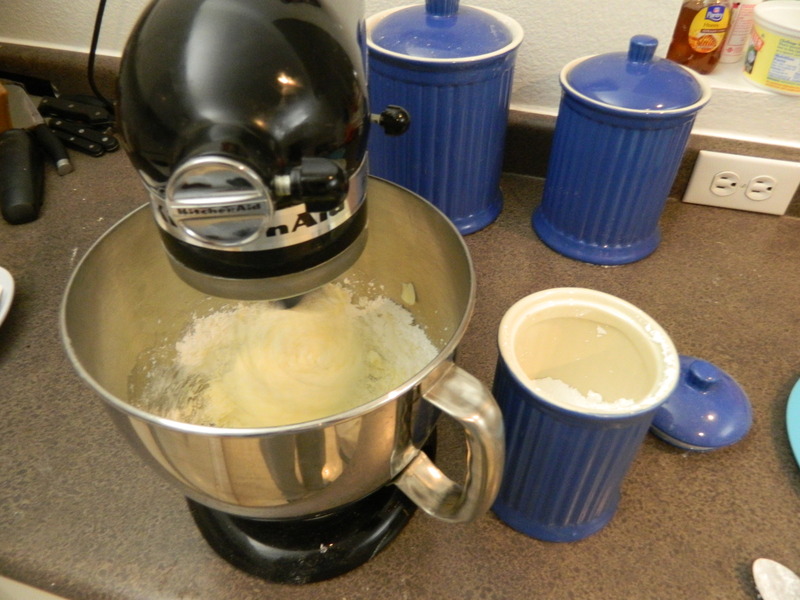 I am sorry I won’t have the bavarian cream recipe for you, here’s a link to the one I used from the Food Network, but it really is a bunch of steps with pretty precise timing so I didn’t have the hands to take pictures while I was doing it. I REALLY, STRONGLY advise you NOT to take the shortcut a lot of sites tell you to with cream cheese and pudding. 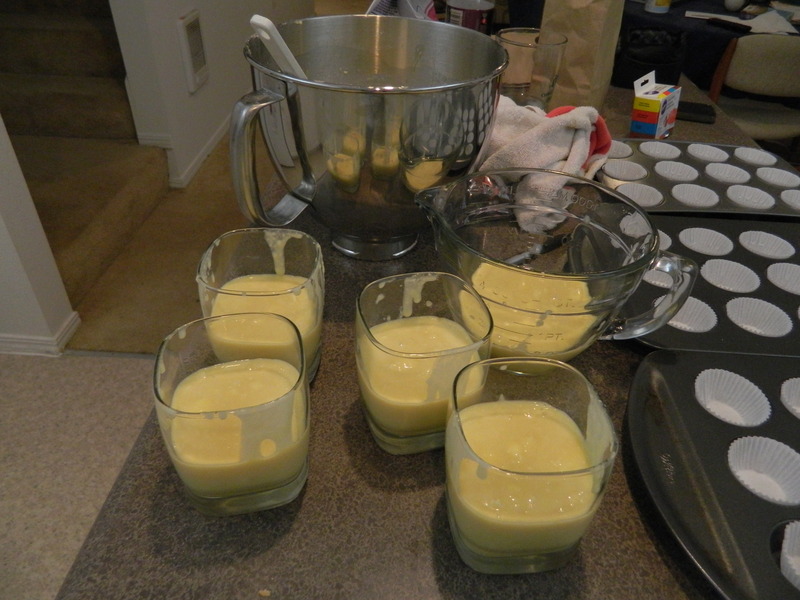 Not only does it sound gross but the bavarian cream is so worth it when you make it from scratch and really just requires attention to detail and making sure you’re prepared with everything you need before you begin. 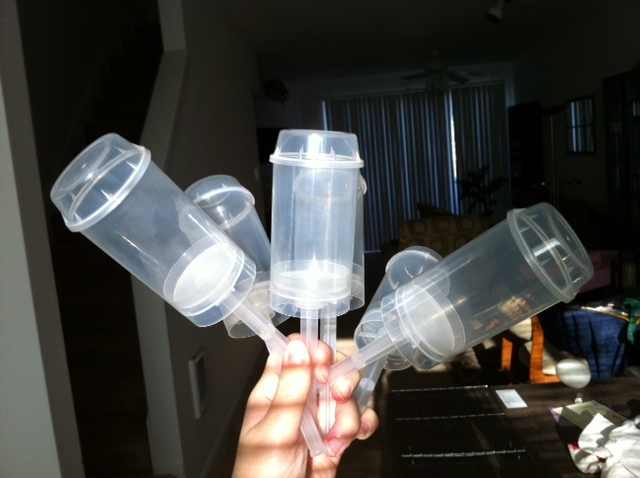 I have to thank my friend Kortnie who helped me put them together; 4 hands were definitely better than 2 here since I had such a timeline to make. She helped put the cake rounds in, was my official taste tester and held the pops for me to make it pretty on top. You can also anchor them like I did in the containers I was serving them in which had those clear marble things in them to hold them upright. 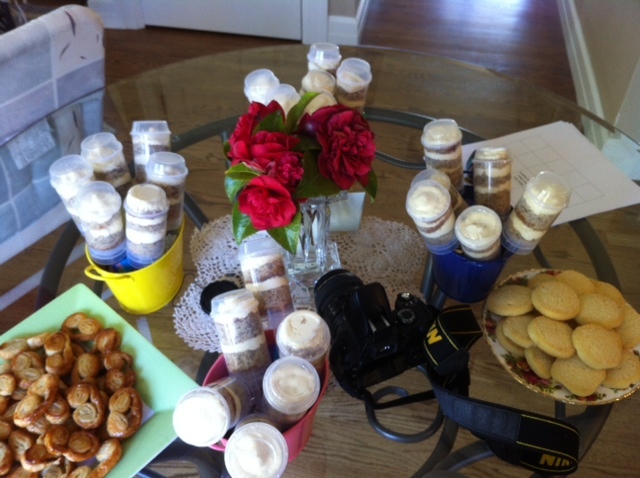 She also helped me make them pretty and deliver them. Thanks love! 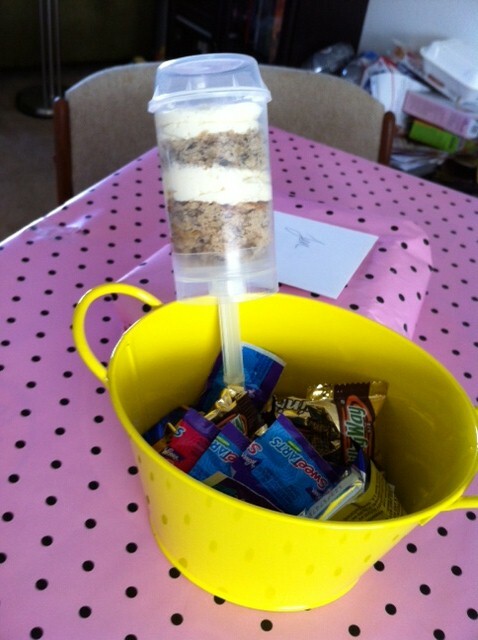 Anyway, once I had the push-up pops filled, i put them in these adorable little buckets I found from the dollar store, and put marbles and little candies in them so that they looked like little bouquets. 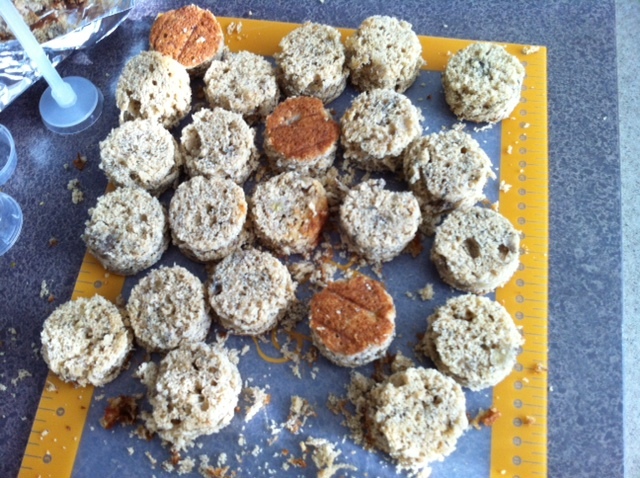 They were a HUGE hit and Jen said they were just perfect. The surprise went off without a hitch and I have now crowned myself the queen of surprises. 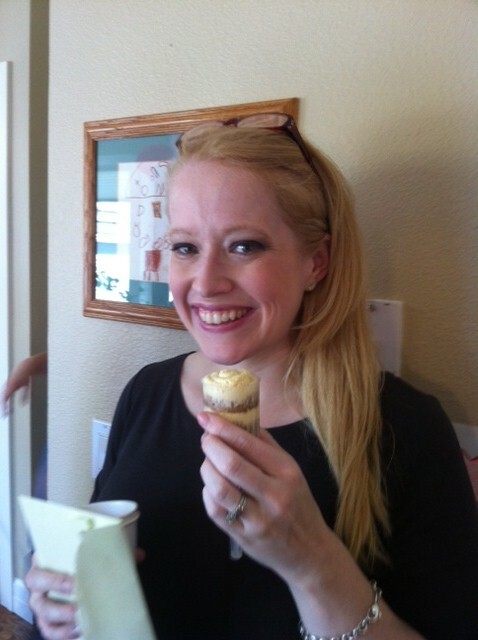 Here’s Jen enjoying her treat! Subscribe to the New Site! This one is closing soon..
Our New Site is Up!! !